TALLAHASSEE, Fla. – Twenty-five years after a big win at Michigan’s “Big House,” Florida State is finally set to meet the Michigan Wolverines once again. The College Football Playoff committee announced Sunday afternoon that Florida State, 9-3 and ranked 11th in the final CFP rankings, will face No. 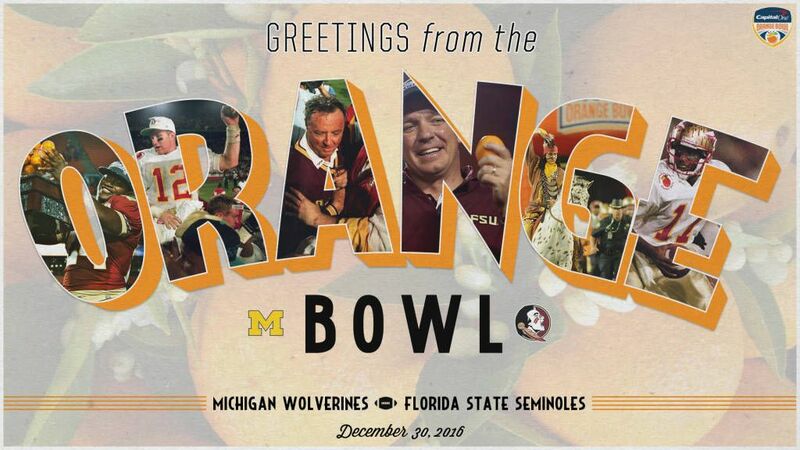 6 Michigan (10-2) in the Capital One Orange Bowl in Miami Gardens at 8 p.m. on Dec. 30. “We are excited and honored to accept an invitation to represent the Atlantic Coast Conference in the Orange Bowl,” said Stan Wilcox, Florida State Vice President and Director of Athletics. “Florida State football has a long history with the Orange Bowl, and it has always been a very popular bowl with our players and supporters. It will mark the Seminoles’ fifth straight berth in a BCS/New Year’s Six game, their 10th appearance in the Orange Bowl and their third game all-time against Michigan. The Terrell Buckley-led Seminoles beat the Wolverines, 51-31, on Sept. 28, 1991, while Michigan beat FSU, 20-18, on Sept. 27, 1986. Wolverines coach Jim Harbaugh quarterbacked UM to victory in 1986. Thirty years later, he’ll line up across from Florida State’s Jimbo Fisher in a game that features two of college football’s premier head coaches. Fisher is 77-17 with three ACC championships and a national title in seven seasons at Florida State. Harbaugh is 78-32 in nine years as a head coach, 20-5 in two seasons at his alma mater. Fisher is also one of two coaches to guide his program to at least five straight BCS/NewYear’s Six games. Alabama’s Nick Saban (six) is the other. “We are very happy to be returning to the Orange Bowl,” Fisher said. “To be one of only two teams to go to a New Year’s Six/BCS game the last five years is great and it keeps that streak going which speaks to the culture of success we have built with this program. The Orange Bowl is as prestigious as any bowl, and we are honored to continue to be a part of their legacy. FSU finished two spots ahead of No. 13 Louisville, which was the Seminoles’ top competition for an Orange Bowl bid. With ACC champion Clemson headed to the College Football Playoff, the CFP committee was left to choose between the Seminoles and Cardinals to fill the ACC’s opening. Louisville had hoped that a big win over FSU in September would give it the edge, but the Seminoles’ four-game winning streak at the end of the regular season – as well as two straight losses by the Cardinals – tipped the scales toward Florida State. Kirby Hocutt, the CFP Chairman and the athletics director at Texas Tech, echoed those sentiments in an on-camera interview a few moments later. “Florida State is a team that improved as the season went along, a very talented team,” Hocutt said. “The committee felt like Florida State was the better football team at the end of this college football season than Louisville was playing at the time. Seemingly chief among them was a November to remember for Florida State, in which the Seminoles pasted their final four opponents by a combined score of 145-54. That includes a 31-13 triumph over Florida, which at the time was ranked No. 13. It was a startling turnaround for the Seminoles, who were 3-2 after five weeks with their goals of national and conference championships all but dashed. Fisher on Sunday credited the team’s seniors for continuing to set a strong example despite a difficult start, and the underclassmen for buying in even after things got tough. Florida State holds a 8-2 all-time mark over the Big Ten (at the time of the game) and is 3-1 against the Big Ten in bowl games. FSU most recently beat Wisconsin at the Champs Sports Bowl following the 2008 season.